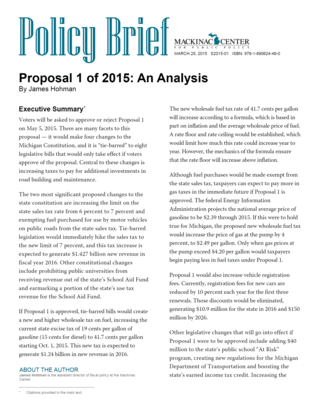 On May 5, Michigan voters will be asked to approve or reject Proposal 1 of 2015. The proposal would raise $2 billion by increasing the state’s sales tax to 7 percent, creating a new and higher gasoline tax and increasing vehicle registration fees, among other things. Most of this new revenue would be dedicated to road construction and maintenance. Other changes that are tied to the proposal include boosting the state’s earned income tax credit, increasing funding for public school districts and prohibiting public universities from receiving money from the state’s School Aid Fund. Based on estimates from data from the U.S. Census Bureau and Bureau of Labor Statistics, the typical Michigan household could expect to pay an additional $500 in state taxes in 2016 if voters pass Proposal 1.